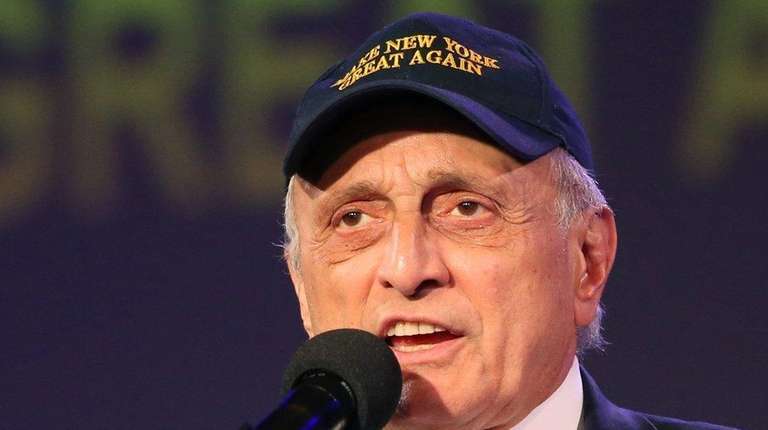 ALBANY — Maverick Republican nominee for governor in 2010 Carl Paladino, just off a two-year stint as one of the President-elect Donald Trump’s longest and closest surrogates, said Thursday that Trump would “absolutely” endorse him if he runs for governor in 2018. “We did talk about it at one point,” Paladino told Newsday. The Buffalo developer declined to discuss the private conversation with Trump. Paladino, who has continued to regularly criticize Democratic Gov. Andrew M. Cuomo, said Thursday that he hasn’t yet decided whether to seek the Republican nomination again, although he said Trump’s success fuels the fire. Other Republicans who have said they are interested in the 2018 race are Westchester County Executive Rob Astorino, who lost to Cuomo in 2014, and Dutchess County Executive Mark Molinaro. Paladino acknowledged that Tuesday’s results in the presidential race aren’t encouraging on the face of it: Democrat Hillary Clinton, a former senator for New York, won 57 percent to 36 percent over Trump, the Manhattan developer. State Board of Elections results show Trump won in 46 of New York’s 62 counties, but as in Trump’s victory nationwide, his successes were mostly in rural counties without a city that dominates the electorate. Clinton won New York City overwhelmingly and eked out a 49 percent to 45 percent win in Paladino’s home county of Erie. Astorino’s Westchester County went for Clinton, while Molinaro’s Dutchess County went for Trump. Paladino, who has also served on the Buffalo city school board, said he has no timetable to decide on whether to run for governor again. Cuomo, who campaigned for Clinton, didn’t respond to a request for comment.